What is a regularity? Believe it or not, regularities have nothing to do with getting enough fibre in your diet! The idea is that you nominate a lap-time and then try to achieve lap-times as close as possible to that time. Bonus or Penalty Points are allocated on the basis of time difference, and the best overall score wins. It's a popular event amongst drivers as it rewards consistency rather than outright pace, where even the slowest cars on the track have an equal chance of winning if they driver consistently. There are usually more cars on track at once, compared to supersprints and club track days, which provides the opportunity for overtaking and being overtaken. Members from the Mazda MX-5 Club of NSW compete in both individual and regularity relay team events. Please contact Stewart Temesvary for further information. Easter 2017 saw the second running of this annual event. Conducted on the Grand Prix circuit at Sydney Motorsport Park, the MX-5 Club of NSW entered four teams, with two of the teams taking 1st and 2nd place in this hotly contested event. The third running of this event was held on the Easter weekend of 31 March and 1 April 2018 on the Grand Prix circuit at Sydney Motorsport Park. Our club entered 9 teams with 38 drivers, so 1 in 4 cars on the track were members of the MX-5 Club of NSW. This event was the largest contingent ever to represent our club at a regularity relay multi-club event. With a heavily altered scoring system, our teams finished 5th, 7th, 8th, 16th, 18th, 19th, 23rd, 26th and 33rd. Results. This event has grown in popularity since the first was held in 2006. It is conducted during mid-winter at Australia's premier race track - the Phillip Island Grand Prix Circuit. The Mazda MX-5 Club of NSW entered one team in 2011, growing to three teams in 2012-2014, and five teams in 2015-2016. Our teams have won four podium finishes in the last seven years, including our first win in 2018. More Info. 2011 - one team finishing 39th. 2012 - three teams and our best result of 2nd, 7th and 15th. 2013 - three teams finishing 19th, 25th and 26th. 2014 - three teams finishing 11th, 12th and 48th. 2015 - five teams finishing 2nd, 11th, 12th, 29th and 38th. 2016 - five teams finishing 2nd, 18th, 25th, 26th and 33rd. 2017 - four teams finishing 12th, 33rd, 38th and 40th. 2018 - six teams finishing 1st, 5th, 22nd, 32nd, 42nd and 43rd (story). Conducted at Winton Raceway, Victoria in mid to late October each year, the MX-5 Club of NSW first entered a team in 2015 for the 10 Hour Relay to celebrate the 10th anniversary of this Regularity Relay. In 2017, the event changed to a 12 Hour Relay, to celebrate the 12th anniversary of the event. This consisted of 3 hours practice and 5 hours regularity on Saturday, followed by 7 hours regularity on Sunday. More Info. 2015 - one team finishing 15th. 2016 - two teams finishing 5th and 18th. 2017 - two teams finishing 1st and 13th (story). 2018 - two teams finishing 1st and 10th (story). The inaugural Challenge Bathurst event was held in November 2016 and was a successful event where more than 200 cars competed in five regularity fields of over 40 cars per field. While Mount Panorama is a daunting track it is arguably the best track in Australia and a very rewarding track to drive. 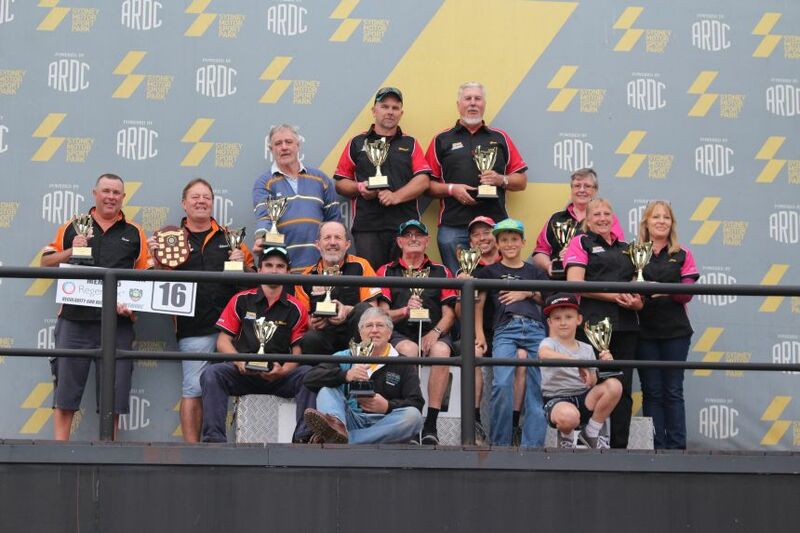 MX-5 Club of NSW members achieved outstanding results with two members winning groups C and D, one member achieving a second in his group E, and one member achieving third in group C.
November 2017 saw the second running of the Challenge Bathurst event and a small but enthusiastic contingent from the MX-5 Club of NSW competed. The torrential rain on the Saturday and numerous red flag interventions didn't dampen their spirits. RPM Chapter achieved a clean sweep of the podium in Group C, while club members also took out second and third in Group D. For a detailed report on this event click here. Motor Racing Australia (MRA) was formed in 2005 to create a cost effective route to racing. Each meeting features races for Super TTs, Sports Sedans, MX-5s, Superkarts, and the latest category additions of Excels and Pulsars. MRA continues to operate cost effective and friendly motorsport, whilst maintaining a high level of safety and communication with competitors. Regularities are usually offered for those who would like to participate in the race meeting, but prefer to avoid the door-to-door racing. More Info. The Festival of Sporting Cars has evolved from the desire of a small group of dedicated individuals to stage motor racing events where enthusiasts could compete simply for the sheer fun and pleasure of it. The regularities are popular with several Club members and we encourage others to join the fun. It's regarded as the closest thing to racing ... without actually racing. More Info.